“Mister, mister. You eat one”, she screeched at me as the plastic bag she was holding squirmed and writhed around. In the other hand I could see a platter of what appeared to be cooked spiders, roughly the size of the palm of my hand. As I approached, she knew she had a sale and set down her wares for me to take a closer look. After squatting down next to her, she opened the plastic bag to reveal what must have been over 100 fury and very much alive spiders! In the mouth and a few chews later, I was oddly satisfied with the taste, texture and experience overall. When I began working on the Lost With Louie project, I had an overwhelming urge to share my reflections of the short period of time I spent in Cambodia in 2003. It has been some 12 years since I was in Cambodia and to this day, the people, the history and of course the food still sit at the forefront of my mind. The smile on her face and her enthusiasm for me to try her food had warmed my heart before her delicious curry had the chance to warm my stomach. 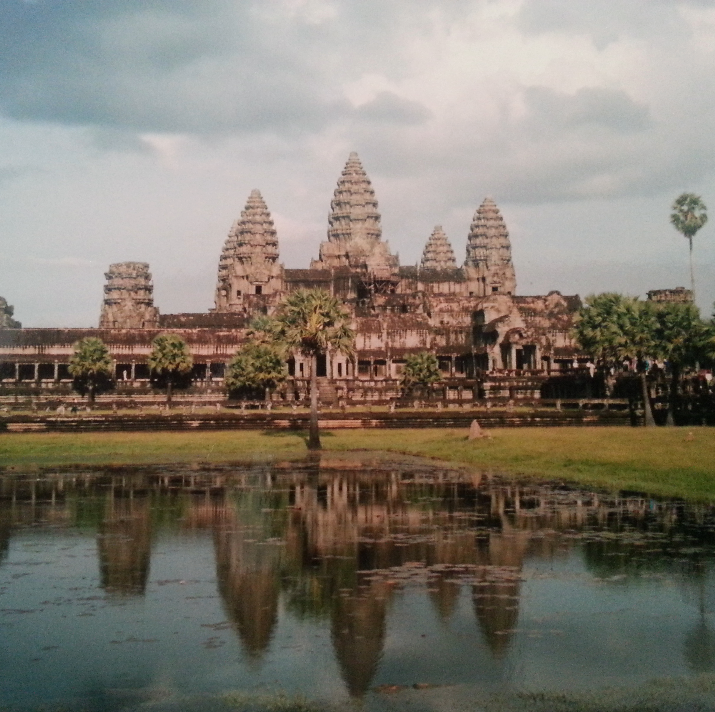 I arrived in Cambodia after having already spent three incredible months in South-east Asia. Life on the road was something to which I had grown accustomed and being so young, I thought I knew everything. For me, Cambodia was perhaps one of the first truly humbling experiences I ever had. The Khmer people are the most genuine and happy people I have ever come across. For a country and people who have suffered so much hardship, genocide and torture, to be as happy as they were is something that not only amazed me but made me understand the power of human nature to overcome absolute sadness. Like most people who travel to Cambodia, I spent the majority of my time in Siem Reap exploring the numerous temples in the area. The history of the Khmer people was not one that I was too familiar with before traveling to the country but it is one that has amazed me ever since. The temples in the Siem Reap area were lost to the overgrown jungle that surrounded them up until not all that long ago, only to be uncovered by various French expeditions in the 19th and 20th centuries. The obligatory tourist angle of Angkor Wat. After Siem Reap, I passed through Phnom Penh on my way to Saigon by bus. The roads in Cambodia were amongst the worst in the world when I was there so this trip was not only uncomfortable but took a long, long time. Back then, Phnom Penh was a confronting place for a 19-year-old kid who was raised in the safety of Australia. There were a remarkable number of people begging for money and food, many of whom were missing limbs due to the land mines that were used in the war against the Khmer Rouge. I remember eating Amok fish curry. Thinking back now, I can recall the vibrant mix of curry paste with lemongrass, ginger and other spices all set off by home-made coconut milk. 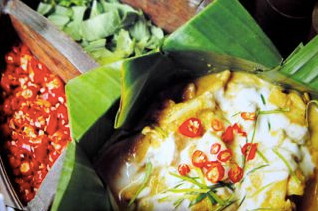 I recall the restaurant in Siem Reap where I first enjoyed Amok curry. The old lady who ran the dirt-floored eatery served me the food on plastic plates. The smile on her face and her enthusiasm for me to try her food had warmed my heart before her delicious curry had the chance to warm my stomach. Amok curry in all its glory! 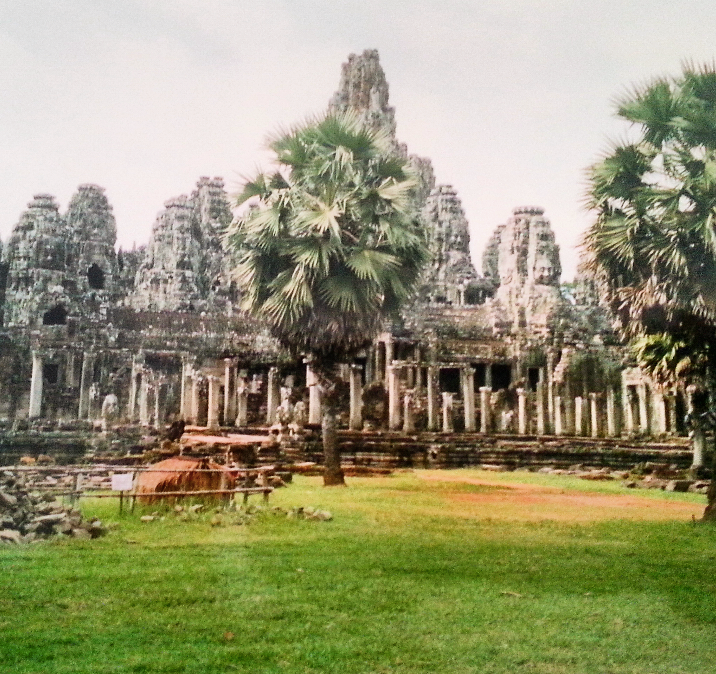 I dream of returning to Cambodia one day. By all reports, it has changed a lot since I was there but the good news is that it has changed for the better as the people move on from their horrible recent history. On a side note, apologies for the quality of the photos in this post. They are scanned copies of produced film photographs that have been sitting in my roof for over a decade. One of the many temples around the Siem Reap area. The spider lady with her afternoon snacks. 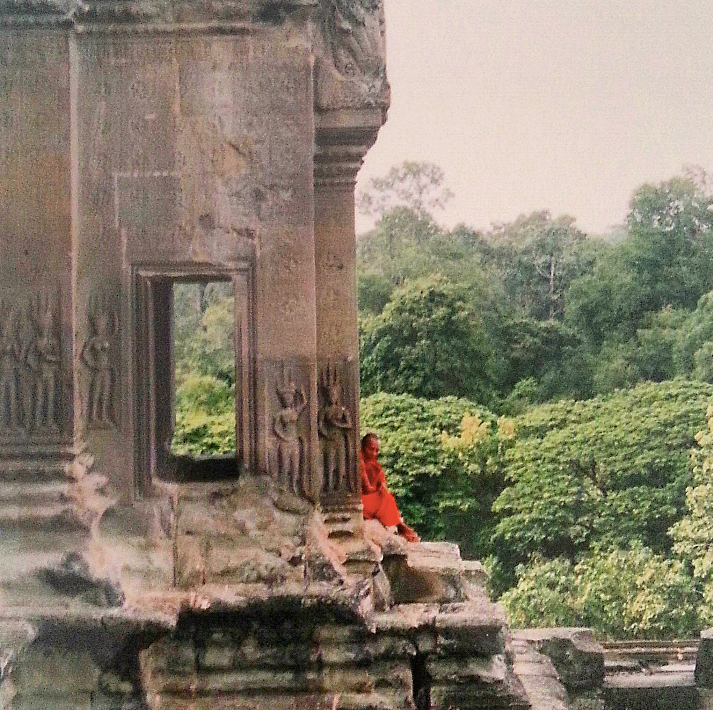 A Khmer monk sitting and thinking. This shot is the first that comes to mind when I think of my time in Cambodia. Surprisingly, it tasted a bit like a savoury donut and nothing like what you’d expect from a spider … I’m guessing that was a lot to do with the oil. If you ever get the chance, I recommend trying it! Love this post- Cambodia is one of the coolest places in South East Asia in my opinion- glad you ate a tarantula while you were there! I agree! I went there with zero expectations and walked away a changed person. I can’t wait to get back there. 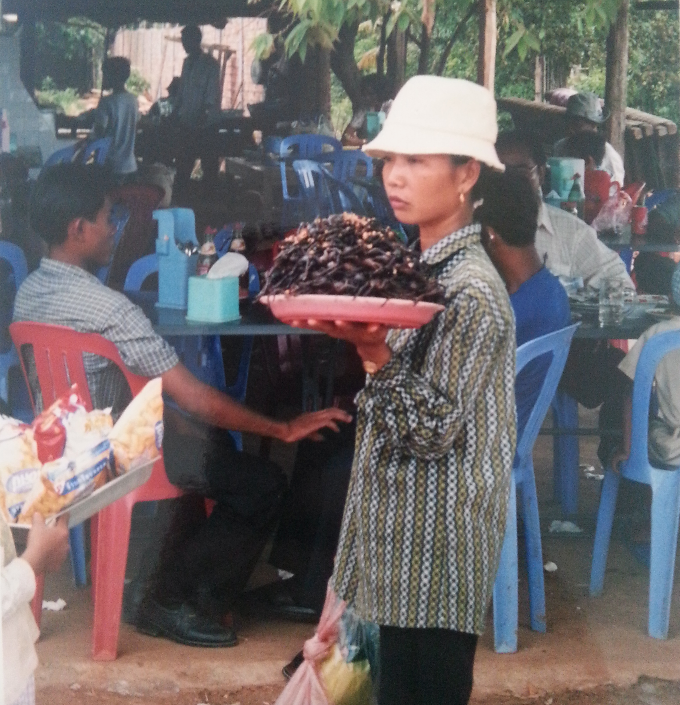 Im dyyying to go back to Cambodia, especially for my 50cent breakfast noodles in siem reap! Ahh cheap and delicious eats is one of my main criteria for selecting a travel destination. So many happy memories associated with eating noodles for breakfast! It was a great trip and an amazing time in my life. I spent a total of 10 months traveling through Asia. I am glad this has inspired you to return to Cambodia. Enjoy your trip and thanks for stopping by and reading my post! I’m sending this link to my daughter who visited Cambodia recently. I cannot believe you ate a spider. It sounds like a Huntsman..? Wow. I couldn’t even face grasshoppers in Mexico but they seem tame compared to big hairy spiders. Good on ya! Yes, it was a big hairy huntsman. It wasn’t so bad to be honest. It just tasted like the oil it was dipped in before I ate it! Thank you very much 🙂 The Philippines is right up there on my hit list. I’ll be in Indonesia and South America for the next 8 months so hoping to head to Japan the the Philippines later next year. What is the best time of year to visit?